INTI continues to strengthen its position as a leader in the American Degree Program with the signing of an agreement with Western Michigan University (WMU), one of America’s top research universities. Western Michigan University (WMU), which recently entered into a formal academic transfer agreement with INTI, is included in the U.S. News & World Report’s annual ranking of American colleges and universities as one of the nation’s top-100 public universities. The Carnegie Foundation for the Advancement of Teaching places WMU among the 76 public institutions in the US designated as research universities with high research activity. “This is a significant moment for us where we provide yet another pathway for our students in the American University Program. INTI is almost synonymous with American education having sent more than 10,000 students to the United States over more than 25 years and we are very proud of our achievement,” said Dr Anucia Jeganathan, INTI’s Executive Vice President; Academics & International Partnerships. WMU was represented by its President, Dr John Dunn, and his delegation to INTI included Mrs. Linda Dunn, Mr Juan Tavares, Director of International Admission & Services; and Ms Kaitlyn Carr, Student Recruitment & Outreach Officer. INTI’s extensive list of colleges and universities in the United States for credit transfer and its track record of sending the most number of students to America for higher education means that its American University Program (AUP) is the most popular program of its kind in Malaysia. More than 300 US and Canadian universities and several universities in Australia accept credits earned through INTI’s AUP. 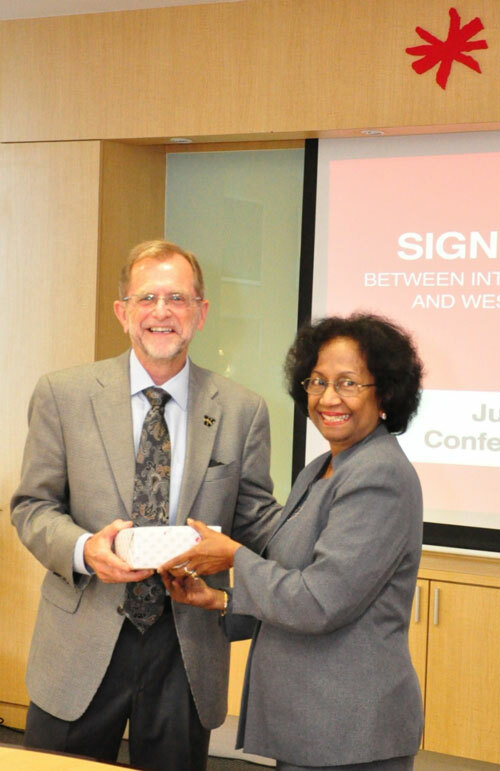 Dr John Dunn (left), President of Western Michigan University with Dr Anucia Jeganathan. University options available to students include Ivy League universities such as the University of Pennsylvania and Brown University where INTI students have successfully pursued studies in the Sciences, Social Science and Actuarial Science. INTI students receive the largest amount of US scholarships in total each year, and this includes offers from the University of Nebraska-Lincoln, Drake University, University of Wisconsin – Eau Claire, Oklahoma State University, University of Central Oklahoma, Illinois Institute of Technology and Iowa State University, to name a few. Students transferring from INTI also pay in-state tuition fees at Indiana University of Pennsylvania, University of Central Arkansas and Winona State University. Students of INTI benefit not only from the institution’s over 25 years of experience and strong track-record, but also gain from the global synergy and resources that Laureate International Universities provides. INTI is part of Laureate, the world’s largest private education network with a presence in 29 countries, with more than 60 accredited campus-based and online universities and 130 campuses, serving over 675,000 students globally.